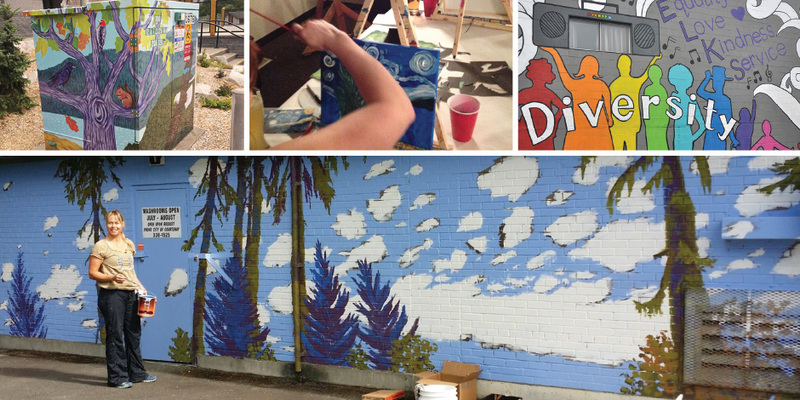 A look at the work of the Comox Valley Community Arts Council. If art is the reflection of community, the Comox Valley Community Arts Council holds the mirror. For almost 50 years, Comox Valley Arts (their short hand name) has been a dedicated activator of art and culture in the Comox Valley. If you’re not familiar with the organization, it might be due to an approach that is less about reinforcing their own brand and more about boosting others. They are a behind-the-scenes force in our community’s cultural narrative—amplifying the work of others, and celebrating our diverse abilities and contributions. For over a generation Comox Valley Arts have been cultivating opportunities for the Comox Valley as an arts producing centre. Evidence of their work can be found across our landscape. Their model includes reflective leadership that shines a light on local talent, provides arts administration services, and advocates for facilities, policy, and projects that support both local emerging and professional artists. Comox Valley Arts connects artists with funding and projects, through strong relationships with local government and key partners, and this is continuously echoed in common spaces throughout our community. Perfect examples of this are murals at Puntledge Park, the Elks Hall, and Woodcote Park by artists like Tracy Kobus, Helen Utsal, and Josh Klassen. Beautifully painted BC Hydro boxes also display this rich collaboration. Comox Valley Arts also organizes exhibitions for local agencies and businesses (such as Comox Valley Airport and Red Tree Coffee), and links venues and artists across the community. They initiated the Comox Valley Poet Laureate Program, which appointed Kevin Flesher as the inaugural bard of the Valley. They also provide administrative support for cultural events like Cumberland’s Foggy Mountain Fall Fair and Downtown Courtenay’s Elevate Arts Festival. Additionally, they’re working on the Comox Valley Community Arts Directory which is a comprehensive inventory of art producers, teachers, and organizers in the Comox Valley. This project will strengthen linkages within the local arts community, provide one stop for information on local art and culture resources, and fuel advocacy for greater consideration of the arts in local economic development planning and funding. On the education front, they aren’t afraid to have fun. Their popular Art & Ale program brings the community together for fun social nights in locals pubs, where professional artists provide guidance for participants of all levels as they explore the techniques and styles of painters like Van Gogh and Emily Carr. The big takeaway from this program is the celebration of everyone’s unique ability and permission to create art. Participants are part of a relaxed, fun-filled evening where the process, the company, and the laughter are far more important than the result. It is a perfect celebration of the artist in each of us. The twice annual Central Island Studio Tour is a powerful expression of their work facilitating opportunities for the arts community, and promoting the region as an arts producing centre. Working with artists from Parksville to Black Creek, Comox Valley Arts provides coordination and marketing for this epic two-day studio crawl. The tour is free and gives art lovers a glimpse of the secret world of art producers. It is a perfect example of the grassroots and decentralized role that Comox Valley Arts plays in the cultural community. Their contributions transcend the limits of bricks and mortar, and galvanize the talent and energy of the Comox Valley.